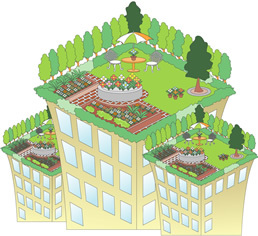 Roof Planting | NEURON JAPAN Co., LTD. This project, based on the results of the “Naniwa Aerial Rice Terrace Project” adopted by the demonstration project supported by Robot Laboratory, has been introduced and implemented on this roof, for the first time in the world. The “Naniwa Aerial Rice Terrace Project” uses robotic control relying on “roof soil” considered optimal for rooftop planting and developed by Masaki Engineering Co., Ltd, and weather forecasting and ground moisture measurement data developed by Aviar Co., Ltd, to make judgments on watering, and by doing so concentrates on vegetable growth and effects on water volume. As a result, compared to the periodic watering used until recently, only 40% of the water volume is used and it can be confirmed that the difference in vegetable growth is spectacular. The intelligent management system combines ground moisture and temperature data with weather forecast data to work as a mechanism to water plants from drip tubes at the necessary time. “Even if the ground has dried up somewhat, it will not water if it determines that it will rain shortly, and so there is no water wastage. You can view the ground moisture and temperature etc. of each area in real-time. A strategic promotion location for next-generation robotics industry cluster-molding promoted (supported) by Osaka City. 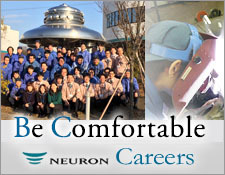 An ecological technology development company. “Roof soil uses high-quality fibrous peat taken from the highlands (3000-4000m above sea level) of China’s Sichuan Province. It brings together the two divergent qualities of good soil drainage and good water retention, and makes it a possibility to grow plants in 50-70% of the soil used in the past. It makes it easy to implement, even on a rooftop, what was once very difficult to implement, and it really is ideal soil for rooftop planting. While it is high-functionality on one hand, on the other, as its primary constituents are natural materials, it is not difficult to dispose of, and it is widely lauded as environmentally-friendly soil. A systems integrator which provides various types of system installation based on their customers’ wishes, combining automatic instrumentation technology with IT technology. The intelligent control watering system, based on the soil’s water retention condition and weather predictions, uses an intelligent watering system with RT-ized autonomous distribution with a demonstration of the Naniwa Aerial Rice Terrace Project to check the results of application to plants and the results of energy saving such as water saving etc. SoilMaster is a system which combines information disclosure functionality etc. with the intelligent watering system, and aims for optimal watering of plants, and to disclose rooftop planting status information via computer and mobile phone.